Every day of the week, The Pollination Project provides $1000 in seed funding to a deserving individual who is working to make the world -- or just their own community -- a better, more peaceful and more sustainable place. Caroline Lovell began Shelter to Shelter to creatively bring voice and healing to survivors of domestic violence, conducting workshops at women's shelters in California, Wyoming, Kansas, Illinois, West Virginia, Texas and more. In the workshop Traveling Postcards, every woman created an intimate handmade card that was then sent to another woman living in another shelter. Each card created became a gift of compassion and solidarity that told the recipient that she is not alone. Caroline is currently working on a "hospital bag" for survivors of sexual assault including information about legal rights and a handmade postcard from another survivor. Solidarity Uganda works in Northern Uganda, primarily in the Amuru District, where thousands of agrarian families are being victimized by attempts at land grabs on behalf of corporate food and oil interests. The group furnished an entire village with technology equipment that is not only used to document the stories of local people and their struggle to protect their traditional lands, but has also helped the village prepare for intimidation from government authorities and mobilize the community. Learn more about them here and read this remarkable firsthand story here. Dana Mahon supports children and families through yoga and mindfulness with her program Child's Pose Yoga in Quadra Island, British Columbia. Dana helps young people calm their minds, manage their anxieties, strengthen their bodies, practice wellness, play, and find peace. As a result of her work, the local school is creating a "calm" room for the kids during the day, and schools in Vancouver are requesting Child's Pose Yoga's mindfulness and yoga practices in their own classrooms. Dana not only used Pollination Project funds to outfit her students with yoga and meditation props and supplies, but also built this wonderful new website which has helped her work expand. Debbie DuPey works with The Corazon de Mujer Center in Guatemala serving twenty women weavers, who were displaced during the country's civil war, and their children. 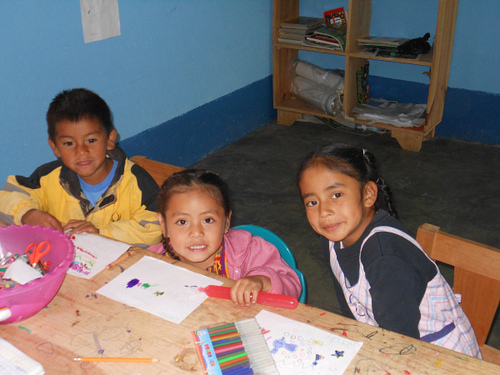 The Corazon Center offers educational enrichment, workshops, and courses in self-esteem, understanding their children's developments stages, and healthy family relationships. "The indigenous people of Guatemala suffer greater poverty, disease and illiteracy," Debbie said. "A long history of oppression and violence has kept them in near-slave conditions." Caitlin Costello is a Peace Corps Volunteer in Jinja, Uganda who works with the St. Francis Health Center, focusing on HIV prevention, education and treatment. The team is creating an ongoing peer education workshop so youth leaders can lead peers in learning about HIV/AIDS, malaria, goal-setting, leadership, reproductive health, hygiene, community development, environmental stewardship and entrepreneurship skills. Peer educators run basic games and icebreakers within the youth group during down time, and one pair even co-taught a peer group on puberty and personal hygiene. Casey Taft is the founder of Vegan Publishers , which publishes books to raise awareness and promote compassion towards animals. Drawing on his past work in psychology and domestic violence research, Casey works to help others see the connections between violence towards humans and animals. Casey and Dr. Will Tuttle are working together on the upcoming book Injustice Anywhere: Essays Connecting Human, Animal, and Environmental Well-Being, which is a collection of essays from several notable authors and activists on the topics of animal, human and environmental rights. Vandana Agarwal works with Earn N Learn, a program under the umbrella of Manav Sadnha, an NGO based in the Gandhi Ashram in Ahmedabad, India. More than fifty underprivileged teens participate in Earn N Learn, where they receive educational support and mentorship, nutritious food, and arts and crafts instruction. Earn N Learn also helps the talented students market and sell their handicrafts online and in retail stores so they earn income for their families while having fun. 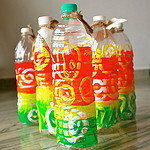 Earn N Learn artisans created the beautiful upcycled water-bottle banks we are offering our Daily Giving participants. Congratulations to our grantees this week for continuing their outstanding work.